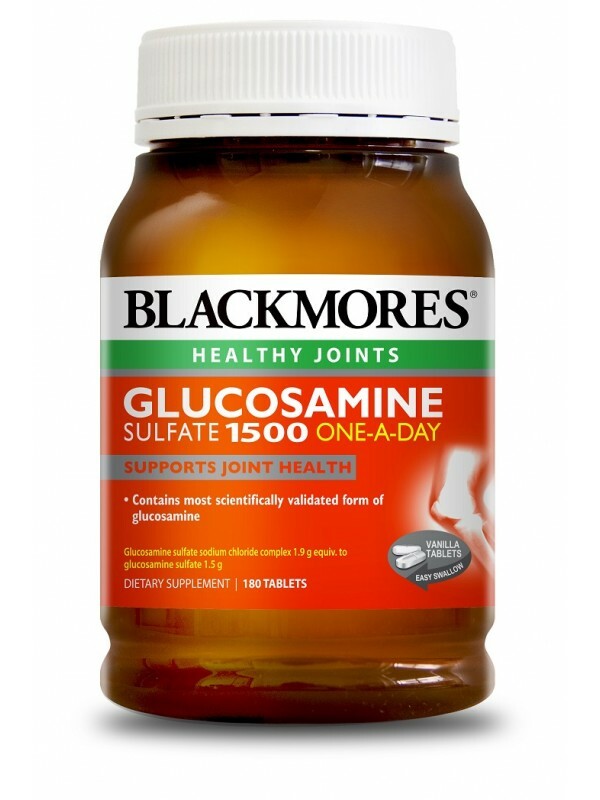 Blackmores Glucosamine Sulfate 1500 one-a-day has been specifically formulated with the most scientifically validated form of glucosamine to effectively relieve osteoarthritis pain in an easy to swallow vanilla tablet. Blackmores Glucosamine Sulfate 1500 may also helps to slow joint damage in osteoarthritis, increase joint mobility and reduce joint stiffness and reduce cartilage wear. Glucosamine and sulfate are natural components found in the cartilage matrix and synovial fluid. Glucosamine is a major building block of the substances that together with protein form the structural units in cartilage. These structural units, called aggrecans, are important for the elasticity, resilience and shock-absorbing properties of cartilage. Ageing decreases the body\'s ability to restore and manufacture normal cartilage. Supplementary glucosamine can be an important source of this vital component of cartilage as we age. Osteoarthritis is characterized by joint degeneration and loss of cartilage. As we get older the \'wear and tear\' effects of use cause degenerative changes in the cartilage. The cartilage becomes more susceptible to breakdown and damage, which may result in the typical symptoms of osteoarthritis. These symptoms include decreased mobility, increased joint stiffness, inflammation and swelling. Glucosamine may help to provide relief from these symptoms, as well as helping to reduce cartilage wear and provide temporary relief of the pain associated with this condition. Researchers found in a clinical trial that patients with osteoarthritis of the knees had a clinically significant improvement in pain and mobility after a period of four weeks using glucosamine sulfate 500 mg three times daily. This product is derived from crustacean shells. Not recommended for people with seafood allergies.